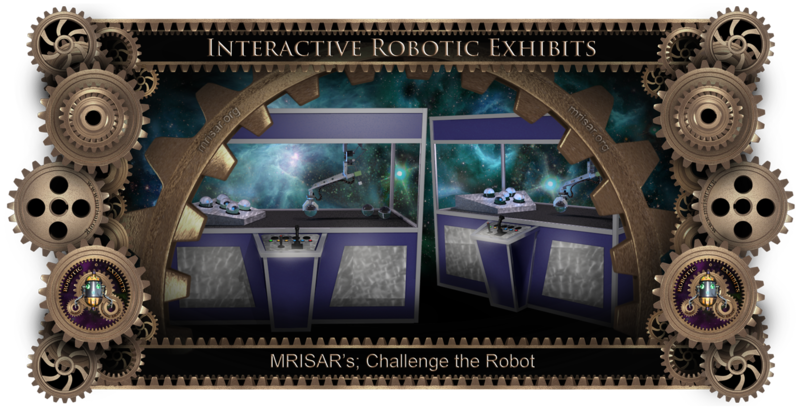 Robotic Exhibit; MRISAR’s Challenge the Robot Exhibit! Human vs. Robot! Control Panel. 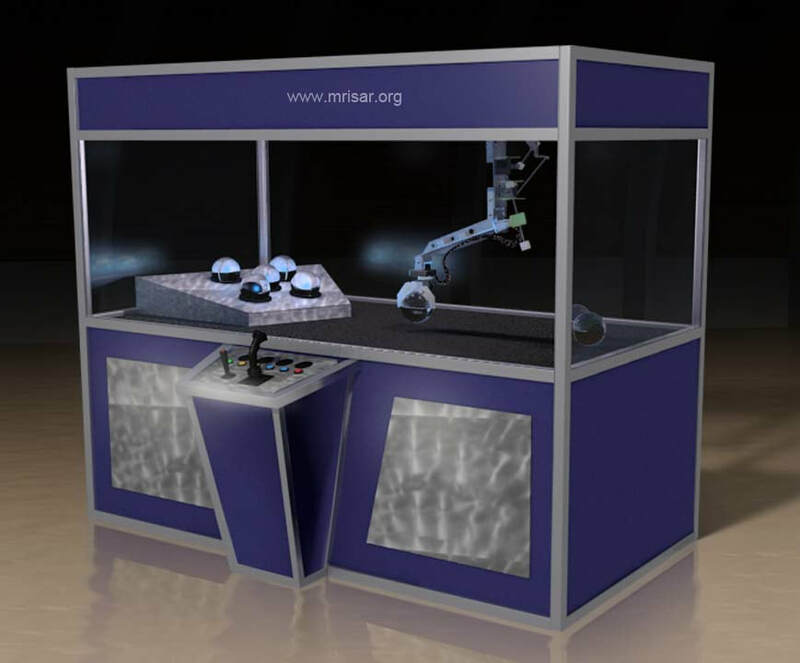 Directions for activity: This exhibit has an activity that involves the robot arm’s ability to do an automatic task faster and better than a human. The human user’s task is to manually control the arm through the same task, hence the term “Challenge The Robot”. Activity: Building a pyramid out of five balls. 1- Push the (Green) Start Button. The reset light will glow for a few seconds and then the robot arm builds a pyramid out of balls automatically. A timer automatically times the arm’s activity. Once the arm is done it lights the balls and resets the balls to the starting point. 2-Next push the “human user’s” (Yellow) Start Button and the reset light will glow for a few seconds and then you can use the joysticks to try to build the same thing that the robot arm built. In effect the arm shows the visitor what to do by example. 3- When you are done push the (Red) Stop Timer Switch and compare your time with the robot’s time score. The exhibit shows a comparison between your errors with the robots and your time with the robots. 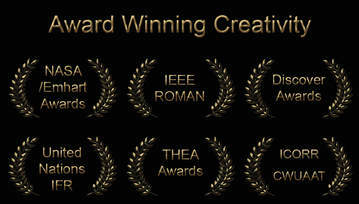 In each activity the robot wins either in accuracy, speed or both. The exhibit challenges a human’s skill and dexterity while providing a unique format to study the engineering principles of a robot arm. This exhibit features a 35” long electromechanical robot arm mounted on a rail system which allows the arm to glide from one end of the exhibit to the other. The fingers come in either black or white UHMW. The exhibit activity is totally encased by clear polycarbonate which allows many people to view the exhibit while it is being operated. The electromechanical arm is designed in a totally open format, all the parts and the key components that operate it are visible for maximum educational merit which relates to STEM. The wrist turns, the elbow moves, as does the shoulder through both the horizontal and vertical axis. The rail is comprised of two tubular steel guides, aircraft grade cable and UHMW mounts. 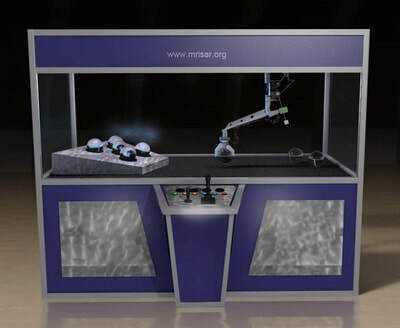 The Robot also comes with voice feedback as a standard with no extra charge, allowing the exhibit to prompt the user as to the status of their progress. The exhibit approximate measurements are 8‘ long x 72" high x 48” deep including the control panel depth. Exhibits are available in a wide variety of colors.